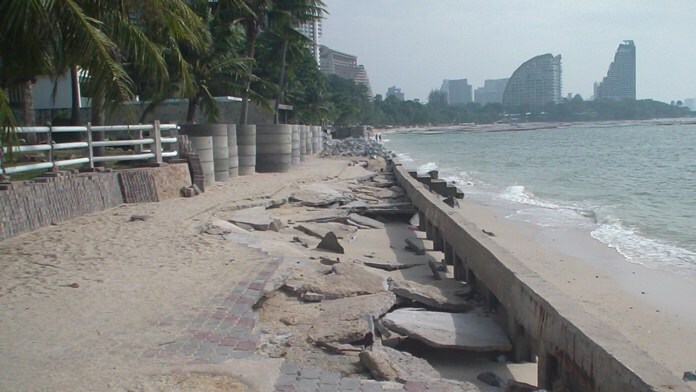 One of the Pattaya area’s oldest beach communities is seeking nearly 15 million baht to repair a shoreline footpath. The beachfront near the Laem Rajchawej British Alumni Center long ago collapsed and has not been repaired. 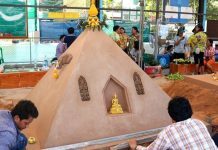 Todsaporn Siriwattana­pairoj, chairman of the Laem Rajchawej Community – which is home to the Sanctuary of Truth in Naklua – said the beachfront near the Laem Rajchawej British Alumni Center long ago collapsed and has not been repaired. The marine center, popular among Asian and Europe tourists, sits in the middle of an old fishing neighborhood that also includes a 100-year-old bungalow and a 500-meter walkway along the beach. All are in need of repair and sprucing up, he said. The community asked Pattaya’s former leaders for 14.7 million baht for renovation, but the request went unanswered. The footpath now has completely collapsed making it difficult and even dangerous for tourists. The community wants the city council to review the area and allocate funds for repairs.